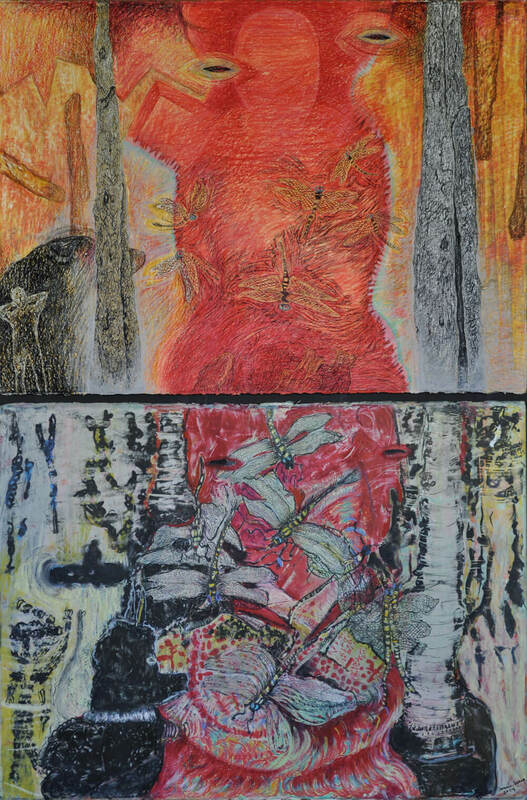 artwork by Bonni Sucec and Susan Beck, at Kimball Art Center, Park City, Utah. Words by Sabina Dana Plasse. Maybe there was a time when going to an art gallery or to a museum was tantamount to eating your vegetables. But we can’t remember it. We remember being enthralled by our first Alexander Calder show, the way the mobiles moved and the way the colors danced. We remember the way sitting in a dark theater with live actors on stage playing at some imagined world made us feel alive with possibilities. And we recall tilting our heads when standing in front of a larger-than-our-little-lives Jackson Pollack because we understood that at its heart, art is about perspective and the worlds that open when you change your perspective. What can we say? Art moves us. The ability to open up and let art in starts with exposure. Community art centers are integral to that relationship and so is a thriving arts community full of artists painting intently in the quiet of their studios or drawing in the midst of the chaos of their homes. 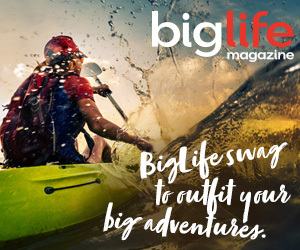 This spring, BigLife brings you some big art. Big mountains and inspiring vistas? Check. An always-entertaining après scene? Of course. Adrenaline-fueled activities? You betcha. Arts and culture? In spades. The communities of Jackson Hole, Park City, and Sun Valley are more than just world-class ski resorts (as if that weren’t enough!). In each of these towns, art thrives. BigLife looks at the way each town’s art center programs anticipate and answer each community’s cultural needs. Many people who come to find a home, start a business, or just plain move to a mountain town for the full plate of recreational indulgences are often shocked by the quality of cultural programming that exists for such small population bases because these high-altitude hamlets are often hard to access and tend to be miles from a cultural metropolitan area. Well, behind the scenes, organizations are moving mountains to arrange for the best possible arts programming, education, and performances for the community. At Sun Valley Center for the Arts, “big ideas” are their multidisciplinary exhibitions, which explore one idea through several disciplines including gallery exhibits, live music performances, high-profile lecturers, performing arts, group discussions, and film. The community that The Center in Sun Valley serves is broad. They program for adults to be sure, but they also partner closely with the area’s schools and it’s not an unusual sight to see lots of eager young faces exploring The Center’s exhibits or to find The Center’s staff on campus and in the classroom collaborating with educators. You will find adults and young adults alike at lectures by Daniel Handler, the creator of the Lemony Snicket series or Sir Salman Rushdie. You will find all ages at art history lectures led by The Center’s curating staff. A recognized museum by the American Alliance of Museums, The Center has the qualifications to borrow and exhibit art they otherwise would not qualify for. This makes programming a visual component to their multidisciplinary programs much better. About the appetite for culture in a resort town? “There’s a definite misconception that in mountain towns all we do is recreate,” says Poole. “We’re lucky to live in a community that’s dedicated to fitness and it’s a beautiful place, but there’s a need and desire to exercise the mind and spirit as well as the body.” And the key to making an impact? Diverse but targeted programming. In Park City and Jackson Hole, just like in Sun Valley, there is a very sophisticated population with high standards and high expectations and there are schools that benefit from having strong cultural centers in town. Planning years in advance, it’s incredible that all three mountain town art centers are able to hit on “hot button” issues affecting the world at large, but interestingly enough, each center has a unique angle. Serving its community with a different approach than Sun Valley’s Center, The Center for the Arts in Jackson Hole functions as an arts campus, housing numerous tenants in its Arts & Education Pavilion, which is a multi-tenant facility housing, hosting, and partnering with 17 local, state, and regional not-for-profit arts and higher education organizations. Fifteen of these organizations rent on a permanent basis. Within the contemporary and thoughtfully designed Arts & Education Pavilion are studios, classrooms, and offices designed specifically for these resident organizations. In Park City, Kimball Art Center has a strong reputation within the community and collaboration is key. “We also like to partner with other organizations and the area’s schools,” says Kimball Art Center Executive Director Robin Marrouche. “We value the trust our community has in us to program quality exhibitions.” The Kimball offers monthly “Art Talks” that are free and open to the public and revolve around the current exhibition. These talks are a way for the community to engage with the exhibitions at a deeper level. And most importantly, these types of events build community around art. Recently, the Kimball, whose home is a building in the center of Park City’s Old Town, was hoping to improve their location, however their board feels the best action is to look for a new location. Marrouche says the plan to change locations altogether has been made because it is now the best and most financially reasonable decision for The Kimball. “We’ve been dedicated to making every effort to stay in Old Town in Park City because we feel the arts are a crucial piece of our local culture, and will help continue to make Park City an international destination,” says Marrouche. The Center for the Arts in Jackson Hole turned an old public high school into an arts organization with space for rent. At the end of 2014, the Center for the Arts in Jackson Hole rebranded and developed a strategic planning initiative that will best meet the needs of the community of Jackson. Bancroft says, “The goal was to design a flexible system that can highlight and enhance what is happening at The Center and where it is happening on The Center campus,” says Anne Bradley, Marketing Director for the Center for the Arts in Jackson Hole. As Jackson’s Center for the Arts fulfills its mission to be Jackson Hole’s cultural hub for artistic, cultural, and creative activity, it offers a 500-seat theater to accompany the resident non-profit organizations on a centralized campus. The Center also offers a home for the community and its organizations to pursue arts education and programming. Wrap your mind around this: in Jackson 800 volunteers, 150 full-time to part-time employees, and 725 classes, seminars, performances, and more are available to over 125,000 people participating in The Center’s programming each year. For the Sun Valley Center for the Arts, a new facility has been an initiative for several years, but while a group of dedicated individuals searches for the ideal location for the new facility, The Center continues to exhibit in their gallery space and partner with Sun Valley Resort, Ketchum and Hailey theaters, and other local facilities for presentation space. This wide-ranging partnership has allowed The Center to reach a broad audience throughout the Wood River Valley community while it is working on new digs. Nope, it’s all about the programming!